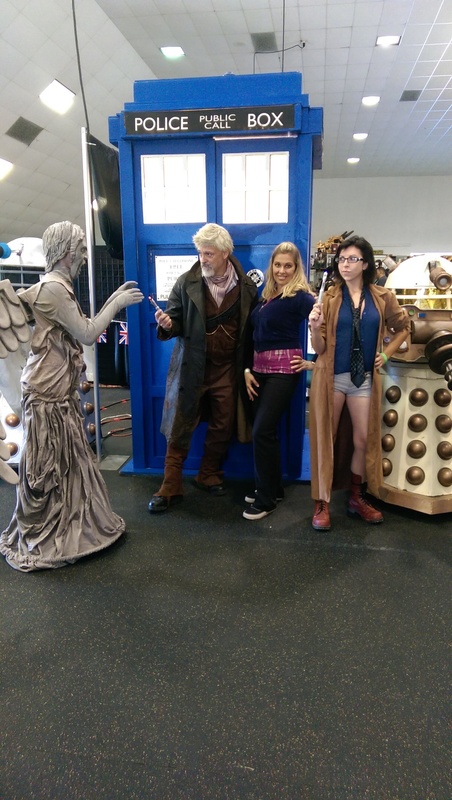 I completed everything on the costume I needed to and was able to take it out for a spin at the Central Coast Comic Con (C4) last weekend. It was comfortable to wear for two full days, and it was extremely well received. In all ways a success. I got through just about every item in my punch list: coloring the gaiters and adding a button, styling the wig to look less wind blown, adding a chain to the waistcoat and darkening its buttons, cleaning and conditioning the coat, tying down some loose items, and weathering everything. I didn't take a lot of photos of the final steps, but I did get a couple while weathering the pants. While working with the rasp, I realized that the cement garden border I was using for support was a better weathering tool. Weathering was an interesting process. Boots, gaiters, pants, and belt were all taken outside and pounded against asphalt, dirt, and bricks. The boots, gaiters, and belt all showed good wear and looked well used. The pants were another matter. They are polyester and seemed to stand up to all sorts of abuse. At one point, I used a wood rasp on them, and they only showed a bit of damage. But, while rasping them, I realized I was using a very rough cement garden border as a base of support, and rubbing the pants directly on the cement finally left the pants looking worn. The dirt and wear marks that I was finally able to achieve after scraping on the cement wall. Finally, I added a bit of makeup. I used some face paint to whiten my eyebrows and the dark bits of my mustache and beard (okay, there wasn't a lot that needed additional whitening). I was able to highlight the hair without whitening the skin, and it matched the white in my beard. I also hadn't shaved or trimmed my beard for awhile, so I looked scruffy and worn out. 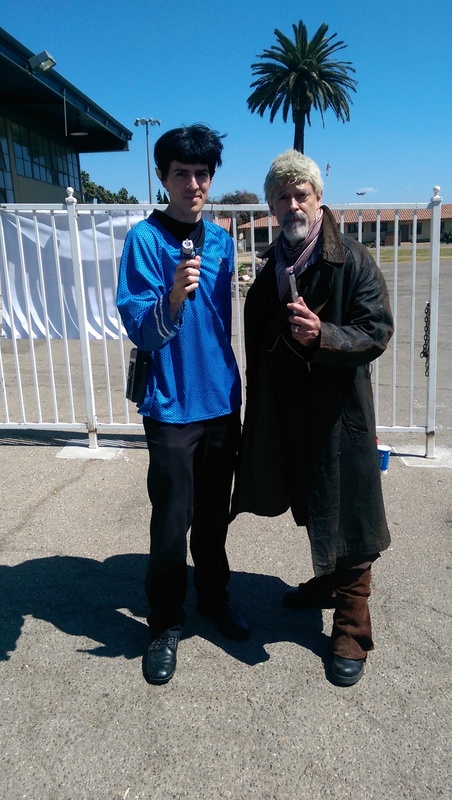 Exactly what I'd expect an old and worn thin War Doctor to look like. In the end, there were only a couple of things I didn't get to, as well as a couple of compromises I made in the costume. They weren't ever noticed, or at least nobody commented on them, so I'll put them on the list of low priority changes to make in the future. In the end, I had a fantastic time interacting with the convention goers and other cosplayers. There was a Dr. Who fan group from Arizona (Az TARDIS) with a booth where they had several home built props including a Tardis, a Tardis' console, a remote controlled Dalek , and a remote controlled K9 unit. 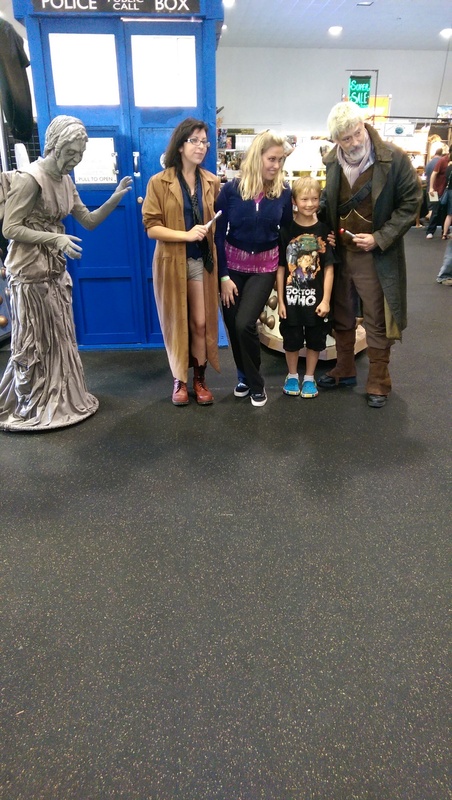 We ended up having an impromptu Dr. Who meetup/photo session and they couldn't have been more gracious and fun. Lot's of good progress this weekend. I've completed all of the major components and am down to the final punch list. Here's what I've complete so far. First off, there's been a last minute change to the waistcoat. Because of the dye problem, I had switched the material I planned on using to some wool I had left over from the Headless Horseman coat. I died it with brown to make a darker red/brown color. I already cut the material and started sewing it together when Harriet found an amazing leather vest at the local Goodwill Store ($3!). It fits perfectly and looks wonderfully weathered. The only problem is that it's not double breasted. However, due to time constraints, I'm going to use it for the initial costume and put off working on the waistcoat until later. I did decide to dye the shirt grey. The whites were too bright, and the grey gave it a dingy look. I tried staining the shirt with tea and coffee but it just wasn't getting there. After wearing it a few times it will get properly sweaty and worn in. I finally got to dying the wig. I'm using FW ink, specifically the Cool Grey. I diluted it for the airbrush, approximately 2:1 water to dye. It was all pretty loose measurements, basically putting ink into the airbrush cup with the eyedropper and adding a splash of water before swirling around to mix. That gave me a pretty good density of pigment so I had some subtle control over the color. I particularly focused on getting the pigment into the roots in order to leave some of the blond coloring. I think it went extremely well. After it all dried, I rinsed the wig in cold water which lightened things up a bit more. After drying, I combed the wig quite a bit in order to break up any stiffness left by the dye. I'm pleased with the results (shown later) and all I have left is to style it with got2b. I want to reduce "blow out" look and make it appear more sweaty/greasy. Tying the shields down to the bandoleer pockets. I spent some time weathering the bandoleer and the leather shields. I did them separately so I could get access to all the hidden bits. I don't have pictures, unfortunately, but I used a wood rasp and a cheese grater to get some of the rough wear. I also took the bandoleer out into our driveway and beat it on the asphalt as well as drag it around our dried out garden beds (California drought). It got nicely gouged and dinged as well as dusty. The shields got a couple of layers of paint, brown and black, before the wood rasp scraped through them, and that added a lot to the ageing (you can see it in the first picture, above). Then I tied the shields onto the bandoleer, glued down the knots, and it's now done-done (that's a technical term that means it doesn't need any more work, as oppose to "done", which means the main construction is complete, but it still needs some finishing). The half gaiters complete with boot straps. I'll try to dull the red coloration and weather them quite a bit. To finish the gaiters I added the strap and buckle that goes under the boot. I had to hand stitch the strap to the buckle, but the rest of the straps were machine sewn. I also used the leather punch to make the holes for the buckle. Add another button on the left gaiter: I left off several button to look like they'd been ripped off in use, but now the gaiter just looks floppy compared to the other side. Condition the coat: it has the proper amount of weathering, but now I want to preserve its look, so I'll add leather conditioner/protection. Darken the buttons on the vest: too bright, too bright! Loosen the bandoleer shield that holds the sonic screwdriver: it's too difficult to get the screwdriver in and out of the bandoleer. Makeup: I need to lighten my mustache and eyebrows. I'd also like to change the ends of the eyebrows to turn up. These are in order of priority, so I'll get through what I can before C4. Sorry, it's been awhile since I've had a chance to post my progress. I've received some purchased pieces, and I've made progress on the parts I'm making. Nothing's completed, but lots of significant progress. First, the boots arrived. They're Magnum Classics, a version of the work boot that most whovian costumers agree is what's being worn in the show. They were on a clearance sale at the Magnum site. 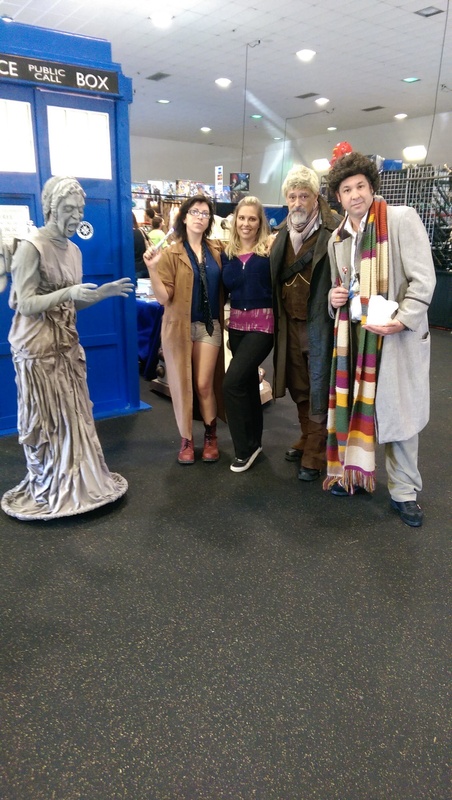 I also received a replica of the scarf worn by the War Doctor. And I found a set of instructions for tying scarfs, including the "twice around" which is how the doctor appears to wear his scarf. The belt I originally receive was too small, and I thought I'd modify it. But I realized there was plenty of time to exchange it for the right sized belt, and it just arrived. Finally, I bought the toy version of the Doctor's sonic screwdriver. It's a very good replica and will serve me in the short term, but i do plan on making a better prop replica in the future. To make the waistcoat, I purchase what I thought was cotton velvet. I bought it in a red color and planned on dying it to a darker, bronze color. Well, I tried dying a swatch in order to get the color right but discovered that it wouldn't take the color. I got suspicious that the fabric wasn't cotton, so I decided to try a fabric burn test. The leather barely burned, the cotton linen burned up completely, the wool smelled like burning hair, and the velvet burned into a shiny glob of plastic. I'd never done the burn test before, so you can see in the photo that I burned several fabrics at the same time to see how they all behave. I tried a piece of cotton linen, a piece of wool, a bit of leather, and the suspect velvet. The cotton completely burned up with sharp edges left at the unburned fabric. The leather wouldn't burn at all. The wool burned very slowly and smelled like burning hair. And the velvet burned quickly but it burned into a shiny black ball of goo. That was clearly synthetic (plastic) and so to dye it I'll need to use a completely different chemical and process. I made some progress with the gaiters. I finished sewing up the two pieces and added the buttons. In the show, several of the buttons are missing, so I tried to match the pattern shown in my close up references. I did a rough fit with the Magnum boot and it looks pretty good. The only things left are to attach the bottom strap and buckle and to weather the pieces. Soft leather cut to shape. Finally, I started making the small leather shields that sit over the bullet pockets on the bandoleer. I settled on black leather glued down to a thin piece of shaped styrene. For some reason, I took a lot of progress shots so the build is shown in the photo sequence. I still have to paint the styrene, attach the shields to the bandoleer, and then weather. That's it for the progress so far. Here are the instructions on ways to tie a scarf.